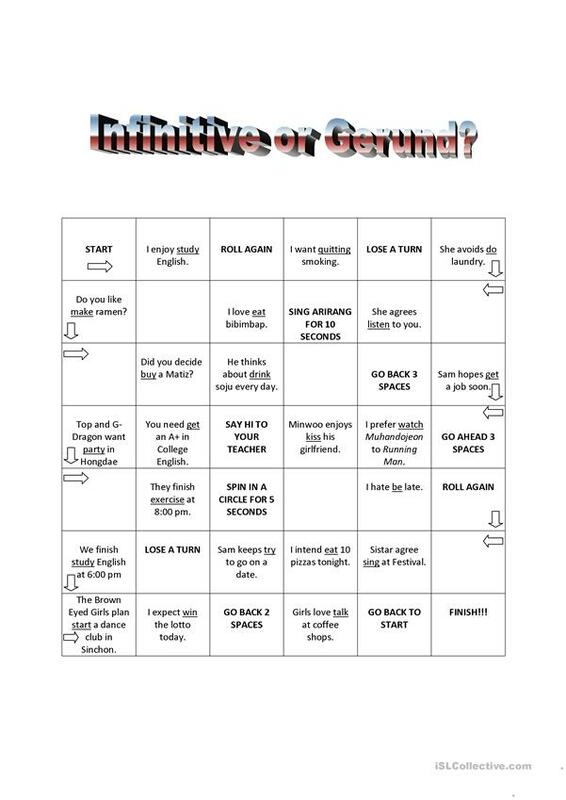 A board game where students have to change the sentence by using either the infinitive form or gerund form. The present downloadable printable is recommended for high school students and adults at Elementary (A1) level. It is a useful material for consolidating Gerunds and Infinitives in English, and is a valuable material for working on your students' Speaking and Reading skills. It features the vocabulary topic of Actions. vegamarie78 is from/lives in United States and has been a member of iSLCollective since 2012-05-10 03:26:03. vegamarie78 last logged in on 2012-05-10 03:26:04, and has shared 1 resources on iSLCollective so far.